The Costa Concordia became an infamous wreck off the Italian coast of Isola del Giglio after its master foolishly drove it on the rocks on January 13, 2012. Salvagers only in 2016 managed to turn the 952-foot-long monster upright, get it riding on massive pontoons, and pull it away to be cut up for scrap. There were about 4200 passengers and crew on the seven-year-old cruise ship when it wrecked. Thirty-two people perished as the ship turned on its side and sank in shallow water. The captain, Francesco Schettino, was tried in Italy on charges of manslaughter, abandoning ship and causing the wreck. Plea bargains were accepted by the court for five other employees, including Roberto Ferranini, the company’s hotel director. Court appointed experts ruled that the crew and the ship’s owner, Costa Crociere SpA, a unit of Carnival Corporation in Miami, contributed to the disaster because of safety breaches. Prosecutors in the case say Schettino steered the ship too close to the island’s coastline. They say it was a publicity stunt for Costa Crociere. Company officials deny this. The Coast Guard says the ship was definitely off course when the accident happened. When the ship struck the rocks the collision tore a 230-foot long gash in the hull that flooded the vessel and eventually sank it. Survivors told of a delayed evacuation because the captain and crew downplayed the seriousness of the crash. When the vessel began to list passenger concern turned into panic as they made chaotic attempts to get off the wreck. Helicopters helped lift some people off, while others slid down ropes or just jumped. Many of the lifeboats could not be lowered from the side because of the way the ship was tipped. 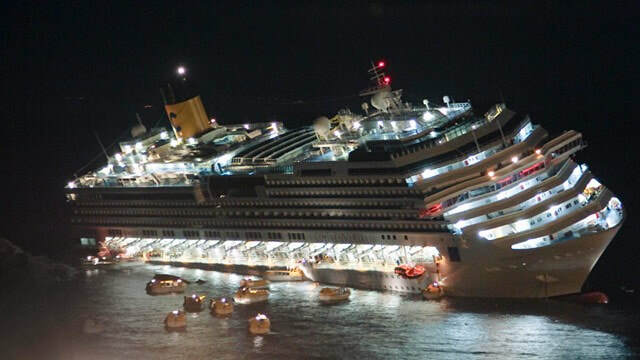 Schettino was among the first to abandon the Costa Concordia, and he apparently ignored a Coast Guard order to get back aboard and direct the evacuation work. Schettino claims that he left the ship when he did because he felt he could best direct the evacuation from shore. He claims that he saved lives because after the collision, he steered the ship closer to Giglio’s port, thus making rescue easier. He said he failed to see a ladder hanging from the ship’s side so believed he had no way of getting back aboard the wreck after being ordered to do so by a Coast Guard official. In spite of his claims, Schettino broke an unwritten rule of the sea. That is that the captain is always the last to leave a sinking ship. For weeks after the wreck, divers risked their own lives searching for bodies in the sunken part of the wreck. The remains of the last body was found by salvagers after they began tearing down the ship in Genoa. The salvage, which has been one of the largest operations of its kind in history, was accomplished by a consortium of marine salvage firms known as Titan Micoperi. Involved were Titan Salvage of the United States and Micoperi, of Italy. The estimated cost of the salvage has been calculated at $2.05 billion. The Costa Concordia was one of a fleet of new cruise liners now on the world oceans. It was built by the Fincantieri’s Sestri Ponente yards in Italy and launched in 2005.